"True friendship among the pastors, the spiritual gatekeepers, will cause that authority to be exercised with exponential impact. But the foundation of those friendships cannot be the pride of public ministry or even an ambitious vision to reach the city! It must be the Heart on the Cross!" I recently met with some friends who have a fellowship of pastors; Was giving them an account of what I knew of myself (scary), this effort and hopes for the future. But it was sobering too, as we got honest about where things are and aren't. One thing that was apparent, is that the illusion of strength won't suffice, even where relationships are built on the concept of one kingdom are not enough, because without love, it is really pride that imprisons people together, while keeping them separate in heart. A divine concept of one kingdom gets perverted by pride and that concept's reality will remain elusive without love. And woefully absent from our hearts is an affection born at the foot of the Cross which should come out in our conversation, action and attitudes. The notion that we can take the city, when we can't even take our hearts is dreadfully misguided. One of the banners to be displayed January 22nd at PC. And so the present status of our relationships among pastors within the Park Circle area is that they hang by a thin thread, not even based on prayer, as much as they are on the concept that we should be praying for one another. That thin thread is now thick enough to get us into a building together for a couple of hours about every ten months. Promotional posters and radio ads will salute the fact that we are willing to publicly come together to seek God, but we must not confuse uniformity with real unity born of humility . The hope is that the Holy Spirit will show to such a degree, that we can see the Heart on the Cross together and in that moment be changed enough to begin a journey together; A journey into the territory of foot of the Cross and prayer based friendship; A place where we are not bound by the desire to do some great thing in God's name, but to love and bless Him by loving one another; Which takes time. Real love is not passivity either. Real Love burns up sin and brings in holiness. "And woefully absent from our hearts is an affection born at the foot of the Cross which should come out in our conversation, action and attitudes." And besides, that great thing has already happened and the truth of it should take our breath away. Do you not see? Can you not hear? The Son of God died! And He died for us! And this Heart was pleading our case as we killed Him. Oh how we should yearn for Him to receive the reward of the lives of this community and city. He deserves their lives. And there is an authority from Heaven to call people to repentence in knowing this deep down; Not just in our heads. True friendship among the pastors, the spiritual gatekeepers, will cause that authority to be exercised with exponential impact. But the foundation of those friendships cannot be the pride of public ministry or even an ambitious vision to reach the city! It must be the heart on the Cross! What primarily drives us should not be the selfish desire that treats salvation as fire insurance or a desire to see change in this city, but change in us! Change for Him because He deserves that change. Which is why the Lord is calling us to seek Him together. We have to do what the religious authorities were unwilling to do in John Nine: Admit that we hardly know Him. We're so busy pretending we are in the know, yet are slaves to the religious system and quite joyless; Quite passionless; Quite powerless. "He deserves their lives. And there is an authority from Heaven to call people to repentence in knowing this deep down..."
One of the many reasons I know the Lord has called this effort into being and is truly working among us, has been His response to me when I suffer rejection by someone I approach for support. He defends them against me. And it is quite aggravating sometimes! LOL. Mom says "We don't receive rejection, but always offer acceptance!" If a church leader finds fault with us, rather than defend ourselves, we embrace his reservations and agree with him. One friend says, "If the devil accuses you, embrace the accusation and defer to the Cross". You got me! C.S. Lewis said that by the time we have discovered a fault within, it has long been an annoyance to everybody else. If they think you are naive, proud and so forth; They are probably right. But when you say: "You got Me!" It gives power to Grace Himself to then say: "No, I got you!" Yet, I have also found that if you ever experience a shared moment with someone, where they can see that .0000000001 percent of Christlikeness within you, despite the rest of the junk, more often than not, they are willing to view you as being like that small percentage in their heart and mind; That is grace & faith: Seeing the final product in the present. And besides, whomever rejects us in this window, may not in the next; And if they never accept us, it matters not because those people are worth the life of Jesus. We don't have a right to cut (judge) someone at any point. I will have to settle for the joy of getting to know them in Heaven! "One of the greatest reasons I'm convinced revival is coming is what God did in us for each other. If He can do it in us, He can do it in anybody." You can see though, why SEEKING and praying together is so important, where we see each other through God's eyes; There you are taken outside of yourself, given a view from above and are moved with compassion as you see a person's vunerabilities. But you also see the person God is faithfully and progressively creating; Someone He can continually re-introduce us to along the way. Just when you've pegged somebody, God surprises with what He is doing in their heart. But what about the separation that comes in relationships along the way for seasons? 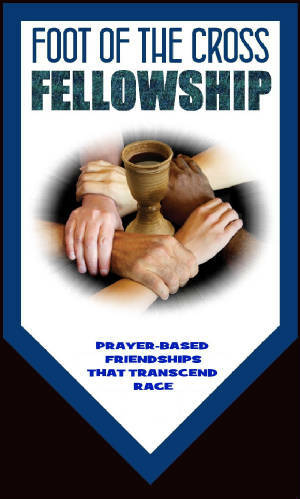 That's a reality too, so long as we are being separated unto prayer and into a fellowship of prayer, which can eventually compell the lost to come in from the highways and byways; But too often, leaders wanting to do their own thing, want control at the expense of excellence, real encounter and friendship. How many friendships have been destroyed on public ministry's altar? It is public ministry that should be put on His altar. The conflict between a certain church leader and I back in 1987-1991 was real. But in 2000 when I was the beneficiary of God through this man multiple times during prayer at the altar, the way I thought and felt about him changed. I've seen his rough side, as he has mine. But we've also seen each other's God-side. When I felt him weeping on my shoulder during a prayer service on a boat filled with pastors on the Charleston harbor, my heart was convicted, melted and changed. I have seen his heart and tears many times since. I've seen the power and wisdom of God flow through him. Today, God's love in him empowers us to do many of the things we have been able to do, but it is not his power that my heart longs for these days, but his company and approval. God gave a friend. One of the greatest reasons I'm convinced revival is coming is what God did in us for each other. If He can do it in us, He can do it in anybody. This thing is not about radio or visions or theme parks or talk circuits or anything else. It is about love. Our mission is to share together in God's love. And the fallow ground of our hearts must be plowed together in prayer to know Him, for He is a fiery and furious Love. "And besides, that great thing has already happened and the truth of it should take our breath away." Do you realize that Jesus moved from treating his disciples as disciples to treating them as real friends? Theologically, spiritually and personally they continued to progress as each got closer to Truth over the course of their lives. But it was through love and friendship the kingdom was advanced. Jesus spent three and one half years teaching them to be friends, knowing the whole way He was going to give His life for them, knowing that all, save one, would flee His side in His most desperate hour. A friend talked to me recently about his heart-felt vision in going up this divinely prepared hill where there's unity, healing of heart, peace and reconciliation. Where we disagreed was the heart with which we were going up that hill. He heard me respond: "I'm going up that same hill too, but I'm being dragged upward." Why say this? Because at the top of that hill is something else that should scare us: A Cross. Up there are the faces of people we'd just as soon as leave behind because they didn't get on board with "the vision"; Even more shocking, we find they have a huge role in the vision and in our lives. Love does not come as naturally as we suppose or pretend. "This Heart can change everything in seconds; Seconds!" The power of Hollywood is nothing in the face of the Heart on the Cross! The internet, the last fifty years of darkness entrenched in our hearts and anything else is nothing in the face of this Heart. This Heart can change everything in seconds; Seconds! The burden is not ours to make things happen, yet this is not a license to be lazy either. We can't settle for Satan's offers to sit and rest in what God has done in and through us. We must move forward up that Hill knowing a Cross waits for us. God will give a vision, so we can put that vision back on the altar, for the sake of a friend who may not yet see; He is the God of the least. In that, we learn to trust God and more importantly, love. In His time, God will do it inside of us because He is faithful. As He did with Abraham and Isaac, He will make a way. Having said this, I truly believe that January 22nd will be an important part of this shared journey. He is doing this and my heart is filled with hope because Love's presence is near. The Heart on the Cross is about to come into view.